When it comes to oral health, it is common for people to strive for white teeth. However, maintaining perfect white teeth isn’t simple; it requires constant attention to your dental hygiene. You have to watch what you eat and drink on a daily basis, as well as, monitor how you are brushing your teeth. The last thing you want is to live with dark yellow-brownish teeth as you age. Luckily, there are a few simple ways to prevent tooth discoloration. If you are serious about preventing tooth discoloration, then make sure you are brushing and rinsing your mouth after every meal. It is good to brush your teeth so that you are getting rid of all the plaque that has built up during a meal. Rinsing with just water is effective as removing food particle. It is important that you are brushing and rinsing after consuming products, such as coffee and tomato sauce, which produce stains. When it comes to preventing tooth discoloration, it is essential that you are using a straw when consuming caffeinated or colored drinks. Make sure you are using a straw to sip coffee, tea, or soft drinks. Using a straw prevents the liquid from making direct contact with your teeth enamel. You purchase metal or reusable straws at your local convenience store so that you can have a straw at all times. One of the most effective ways to prevent tooth discoloration is to see a dentist for a regular check-up at least twice a year. At your dental check-up, you will receive a professional cleaning which will remove any built-up stains. 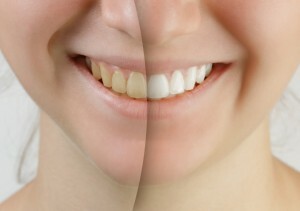 Your dentist will teach you methods to prevent discoloration and yellowing. You can even receive professional whitening treatments. This entry was posted on Friday, October 26th, 2018	at 2:44 pm	and is filed under Dental Care in Catonsville	. You can follow any responses to this entry through the RSS 2.0	feed. Both comments and pings are currently closed.